Designed for durability in Telecommunications, and Electric Utility applications, the GNB FRONT Terminal MARATHONTM series provides high performance and reliability in long duration discharge applications. The location of the terminals on the front (vs. the top) of the battery greatly facilitates the installation and maintenance of the product when placed in a cabinet enclosure or on a standard relay rack tray. 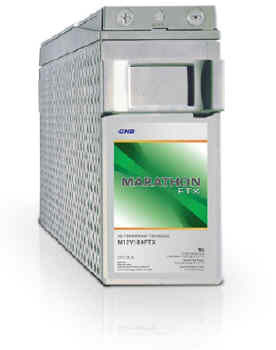 The MARATHONTM Front Terminal battery series highlights another example of GNB’s extensive experience and world wide leadership in VRLA technology. Durable Flame Retardant Polypropylene Container and Cover compliant with UL94 V-0; 28% L.O.I. I. Reinforced Flame Retardant Polypropylene UL94 V-0; 28% L.O. One-way, self-resealing vent. Recessed design accommodates applications requiring central degassing.